Due to the large capacity of the Hollywood Casino Amphitheatre (previously known as First Midwest Bank Amphitheatre), it is best to plan your seating arrangements or locate your seats before arriving at the venue. This will ensure you get to your seats easily and efficiently. The amphitheatre is split into three sections. 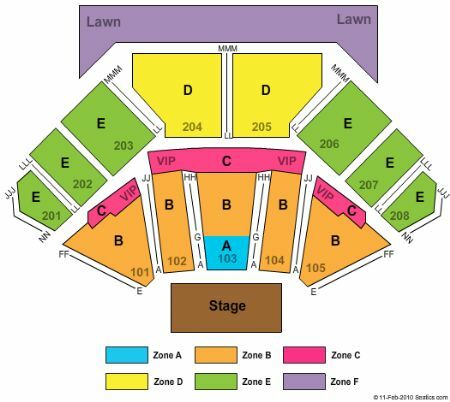 As indicated in the image below, the lawn area is situated at the rear, with seating in front of the lawn area. VIP seating seating is raised above the seating in balcony suite areas. These seats allow for a better viewing angle towards the stage. Zone B is situated closest to the stage, for those who like to get up close and personal artists. The Hollywood Casino Amphitheatre has extensive accessibility options for those who require them. Accessible seating can be purchased online. Please inform the representative that you require accessible seating at time of purchase.